Artistic wall decor for airport terminals, offices, corporate lobbies and OEMs. 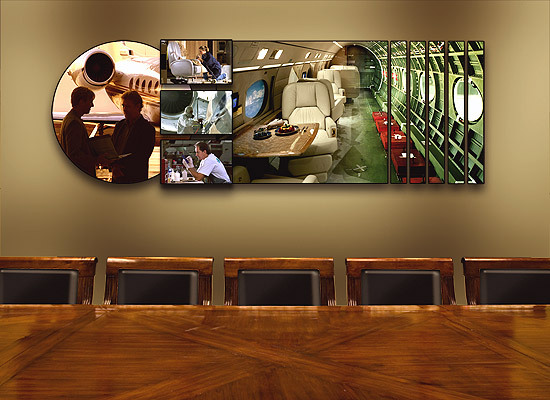 Custom-designed aircraft wall decor makes an effective artistic statement in airport terminals and offices, as well as corporate lobbies and OEMs. Let our design and installation team create a dynamic display for your facility, or choose from one of our pre-designed displays. Contact us today to discuss your project ideas. worldwide who need corporate aviation photography for sales, leasing and archival purposes. Interior and exterior private jet photography can be seen throughout the portfolio section of this site. photographer highlights the unique features aboard the corporate jet.